Being part of the Navy Yard includes access to a diverse business community that offers opportunities not just for growth, but also initiatives to foster civic and corporate engagement in the community.. Representatives from Navy Yard businesses meet quarterly as the Navy Yard Engagement Committee to discuss and plan community events and programs. We are focused on four key areas of engagement: education, energy, sustainability, and community. We support our Philadelphia neighbors and community partners. In collaboration with the School District of Philadelphia, the Navy Yard adopted the F. Amedee Bregy Elementary School, a K-8 school serving South Philadelphia since 1923. Our goal in this adoption is to support, collaborate in, and facilitate opportunities for the students of Bregy Elementary to achieve their full potential. The Navy Yard will support Bregy Elementary through initiatives such as school supply drives, career development, and events like an anti-bullying assembly in conjunction with the Harlem Globetrotters. 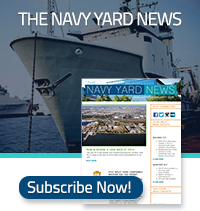 The Navy Yard is committed to providing a sustainable, efficient, and green work environment. Navy Yard businesses and employees work in adaptively reused buildings or LEED certified new construction, enjoy over 20 acres of open park space that reduces stormwater runoff, and have access to green transit options like Navy Yard buses, Indego bike share, car share, and EV chargers. The Navy Yard is powered by a 35-megawatt unregulated electric grid, one of the largest unregulated electric distribution systems on the East Coast. This is an ideal setting for smart grid research and for demonstrating and deploying energy-efficient technologies, energy generation and storage, and microgrid controls and distribution. In 2017, the Navy Yard embarked on the first phase of a community-shared solar power project. The initial installation included 1,295 solar panels on a rooftop in the Navy Yard and will provide a total of 440kW system capacity. Allowing companies at the Navy Yard the opportunity to share the benefits of solar power without installing solar panels on their property, the Navy Yard Community Solar project was the first of its kind in Pennsylvania, joining 25 states in the U.S. with community solar projects underway. When fully operational, the project will produce 930,000 kWh of clean, reliable, and cost-effective power per year.